Zoo Director Derek Grove has clinched an award in recognition of his 36 years of dedication to Dudley Zoo, its staff and its animals. 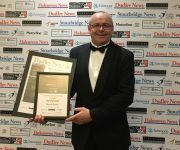 The 55-year-old father-of-three was named as the Lifetime Achievement Award winner at the Forging a Future For All Awards ceremony at the Copthorne Hotel in Brierley Hill last night. The Dudley, … Continue reading Well deserved Derek!